A story about Christmas and family in the old neighborhood. People being there for people doesn’t require heavy lifting. Much of the time it’s all about being in the right place at the right time. But maybe most important of all, it requires a keen eye, a willingness to help and the initiative to make the first move. In my experience, I’ve found that most people want to help out if they can. Sometimes a gentle nudge in the right direction is all it takes. Be the one who nudges the next person down the road to being there for other people. Show them how it’s done, and they’ll experience for themselves the rewards of giving without any expectation of return. The rewards are so great that they will want to experience that feeling again. Instead of needing a nudge, they’ll be on the lookout to help others. And when we’ve reached a point where everyone is looking out for each other, then we’ve accomplished something quite remarkable. Be an example to others. Not just around Christmastime, but throughout the year. It’s December 1955. The setting is a small town in Spain, where a hot water fountain flows in a crowded town square on a crystal-clear night. Giuseppe noticed an old woman empty a wrinkled brown bag containing a few breadcrumbs for the birds. She smiled to herself as the birds ate under the light of a full moon. “What kind of a world would this be if we could not be there for one another when we’re needed?” Ernesto said. Giuseppe nodded, understanding beginning to settle in. Ernesto stood and excused himself. He walked over to the old lady standing among the birds. He said a few words to her, removed a bag of birdseed from inside his jacket and handed it over. She thanked him and he returned her smile. Then he motioned for Giuseppe and the two men walked toward the sound of music in the distance. The first Christmas carol concert of the season was just beginning. 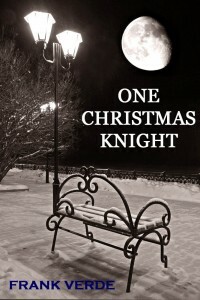 Simple acts of kindness by people from all walks of life influenced “One Christmas Knight.” My mother, father, the couple who ran the neighborhood luncheonette, as well as the butcher, baker, and our eccentric barber, “One Christmas Knight” is filled with the people who define a neighborhood. Those who provide its heart and soul. They make this a tale to keep in mind all year-long. Can’t wait to read it !!! !